Flora's Musings...: Flora Reviews... "Once Upon A Curse: 17 Dark Faerie Tales"
Flora Reviews... "Once Upon A Curse: 17 Dark Faerie Tales"
..So what’s this book about? This book (approx 360 pages) is a collection of seventeen short stories and novellas by best-selling and award winning fantasy authors, with the common theme of being dark faerie tales. Seventeen magical stories from NY Times and USA Today best-sellers and award-winning authors that will entice you to the darker side of faerie tales. More Grimm than Disney, in this collection you’ll find twists on Snow White, Hansel & Gretel, Rumplestilstskin, The Snow Queen, Cinderella, The Pied Piper, Alice in Wonderland, and Red Riding Hood, plus new tales paying homage to the old traditions. I downloaded this Kindle version for just 99p from Amazon UK in the hope of finding some “new to me” authors while reading some new tales from a couple of existing favourites. I will give a brief review and rate each story, if you want to find out more about each author, just click on their name to be whisked away to their own little corner of the web. This really reminds me of those old dark fairy tales I used to read; The Brothers Grimm, old Welsh tales like the lightening tree, etc. I liked it - it had the same feel. I will be looking out for more from this author. Story 2 - FAE HORSE by Anthea Sharp – Faerie bargains can grant any desire, but be careful what you wish for. I felt that this was neither a tale written in the old traditional style or modern. The story was set in times past but it was the language and writing style (sentence structure, etc) that left it adrift. I still enjoyed it but it felt lost compared to Story 1. Story 3 - THE QUEEN OF FROST AND DARKNESS by Christine Pope - Her heart is the only thing colder than a Russian winter…. I enjoyed this retelling of The Winter Witch or Snow Queen. It was a very short version and so wasn't as complex or as in depth as some other incarnations but it was still enjoyable. Story 4 - BONES by Yasmine Galenorn - Sometimes, your most cherished dream can turn out to be a nightmare. Wow! I really enjoyed this dark fairy tale; it reminded me of the Greek fairy tales that I read as a teen. I’ll be looking out for more from this author. Story 6 - DANCE WITH THE DEVIL by Donna Augustine - When the devil makes a deal with a dancer, he gets more than he bargained for. I really liked this one; it's very short but didn't feel rushed. What I liked the most is like all good fairy tales, just when you think you know where the story is going - it doesn't! ;-) I will be looking out for more stories by this author. I am already a fan of Ms Bellet’s writing style and this didn’t disappoint. I really loved this tale - it felt & read like a traditional folk tale. Brilliant!" I liked this story. It is written as a memoir from the point of view of an old priest. You get clues as to who he was in his youth and I like the way you're lead to the final realisation. Story 9 - BEAUTY INSIDE BEAST by Danielle Monsch - Happily Ever After ain't guaranteed when Once Upon a Time is here. This had potential, the beginnings of a good story (or series) but it kind of leaves you hanging - a lot. Not a good story to include in a box set like this as it feels more like a taster sample; the first 10 chapters of a book. Story 10 - DRAWN TO THE BRINK by Tara Maya - Sajiana's job is to hunt down monsters brought alive from paintings. She never expected to meet one so handsome... or to need his help. It was good, I really liked it. Although this tale takes place as part of a series that I am unfamiliar with, I found the story and characters very easy to follow and believe in. What a fantastic premise for a fantasy world! I will look for more books in this series. Story 11 - FAESCORNED by Jenna Elizabeth Johnson - The Morrigan, Celtic goddess of war and strife, must relive a painful memory that reminds her of what she can never have. I thought that this was a good story. This tale feels like an additional novella for an ongoing series and as such, there was obvious history and back-story that I was missing, having said that, I have read various stories within the Celtic mythologies and was familiar with this complex goddess so it was nice to read a bit of fantasy fiction that tried used this as it’s premise. Story 12 - THE VARIANCE COURT by Alexia Purdy - Anna, a struggling college student, discovers a mysterious ring that turns her quiet life chaotic when the ring's magic doesn't do what it's told. I didn't like this; not my cup of tea. I think this is an opening novella/short story for a new series. The premise to this story was not original and the execution was poor. My 11yr old niece writes stories and I felt that the writing style, execution of grammar and the construction of sentences/paragraphs/chapters as well as the general plot development here was of a similar standard. I felt no love for our main character, Anna, in fact she frustrated the hell out of me; I didn’t like her at all. Story 13 - THE MORRIGAN by Phaedra Weldon – A young man discovers he has leprechaun blood – and is wanted by dark faerie forces. I haven’t read any fantasy books starring leprechauns before… but I certainly loved this one. What a great urban fantasy tale. I found the writing style easy to read, the plot had a good pace and contained a great balance of tension, action with enough some mysteries were solved while other questions are left to be explored within future tales. Story 14 - ALICE by Julia Crane - A twisted tale of Alice and Wonderland. Facing madness and an ominous prophecy, Alice chooses to follow her heart despite knowing her world is about to change forever. Story 15 - STILL RED by Sabrina Locke – When the Hunters come, can there be any escape? I did like this dark, sometimes surreal, short story; it was good. The writing was beautifully crafted and very intelligent. It read like a cult classic; passionate, poignant but with a sprinkling of magic to leave you bewildered or awed depending on your interpretation. I enjoyed this story; Ms Blackstream took the premise from Rumpelstiltskin and made it her own. This is a lovely short story/novella which can be read as part of her Blood Prince and Blood Realm series. I found it easy to read and liked how the story developed. I absolutely loved this story. I was completely transfixed from start to finish; the way the story was written and how the characters of the demon and the princess revealed themselves, their journey, the plot evolution and the poignant ending (yes, I blubbed). I will be looking out for more books from this author. This is a good box set. I have enjoyed having this as an ongoing back-up, to be able to pick up and read when I’ve had a bit of free time. What I’m thrilled about is that I have found some new to me authors to check out and I’ve really loved reading 4 out of the 17 tales while only a couple of stories were not to my taste. I think that is quite rare for a collection of this size and price. I think it’s got a nice assortment of different settings and sub-genres under the faerie tale themed umbrella to suit most tastes. 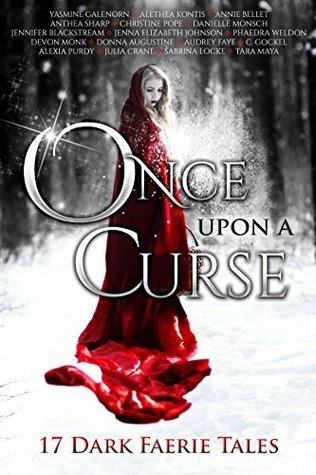 So, has my review of ONCE UPON A CURSE: 17 Dark Faerie Tales sparked your interest? Just click on any of the links below to check out the book yourself, or to find out more about other books I’ve read, take a look at my profile on Goodreads.